By Tenzin Mingyur Paldron (Berkeley, California). Republished on TPR with permission by the author. In the current era, we believe communication is possible almost instantaneously, across all spaces. A message can be transmitted across the world. It doesn’t matter where it stems from. Once digitally transmitted, it is carried, expanded, recreated…the trace of its owner is easily made invisible. Such technologies conquer time and boundaries, rendering divisions like individual status and national boundaries impotent. Nameless, ‘we’ can finally mean ‘everyone.’ In such an evolved world, what is left in a name? The message reaching me now, the one that grasps hold of me in this moment, does not use a nameless, voiceless channel. Its speech is an action, incredibly rooted in a specific place and time. Its message brings something into being – by the same process, it destroys something else. The consolation of the message is that thing it leaves; life has been sacrificed, but by the same act it may be offered anew. On March 17 of this year, twenty-one-year-old monk Lobsang Phuntsok set fire to himself outside Kirti monastery, located in Ngaba county in China’s Sichuan province. His actions set off a month-long siege of Kirti monks and Tibetan residents of Ngaba by Chinese forces, where phone lines were cut off and tourists were banned as residents and monks engaged in massive peaceful protests. Hundreds of monks were reportedly sent to “re-education through labor” camps as a result of their standoff with authorities. Lobsang Phuntsok’s was the first verifiable death of a Tibetan monk self-immolating as a form of protest against the Chinese occupation of Tibet, although another Kirti monk set fire to himself in February 2009 in protest against monks being prevented from observing traditional Losar (Tibetan New Year) prayers. 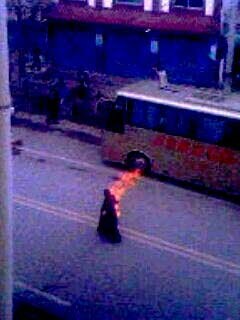 The monk was shot and arrested by authorities shortly after walking through the marketplace ablaze and holding the Tibetan flag and a picture of the Dalai Lama. It is unknown whether he succumbed to his wounds or is still in detention. It is possible the Chinese government was concerned about a new outbreak of unrest near the anniversary of the unprecedented 2008 protests that broke out across Tibet. Lobsang Phuntsok’s act was followed by a monk from nearby Kardze Monastery self immolating and subsequently dying in August, as well as a string of self immolations in the past three weeks. Since September 26, five Tibetan monks age 17 to 19, again of Kirti Monastery, have set fire to themselves. All were arrested before dying, and their whereabouts and conditions are unknown. Although self immolating may be a recent, relatively unprecedented phenomena among Tibetans, monastic or otherwise, it take place against a long history of protest and resistance to Chinese colonialism. While it is not possible to pin the origins of self-immolation as protest on a religious or cultural disposition, that it arises out of an unbearable circumstance of political and social injustice is unmistakable. The bodies of teenage monks are burning in Tibet. What is the message? Not just whatever slogan bystanders may have heard them articulate, but what message is being spoken in this act as an event? What do these acts signify, what might they produce? And what is required of us in order to truly listen? For in a time when all messages are simply transmitted, there is a kind of learning and listening that must be acquired, I believe, in order to apprehend the spirit and significance of this message. The self immolation of Thích Quảng Đức during the Vietnam War in protest of the treatment of Buddhists under South Vietnam’s Diem regime (widely supported by the U.S. for its anti-communist stance) caused several other monks to follow his example, and is seen is seen to mark the turning point of the crisis faced by Vietnamese Buddhists that led to the toppling of the regime. In December 2010, Tunisian street vendor Mohamed Bouazizi’s self immolation became a catalyst for revolution, setting off demonstrations across the country. I cannot guess at what these acts in Tibet might bring about. Unlike the example of Tunisia, Tibetans are viewed as a minority “other” in China, and so it seems unlikely that political acts by them would inspire the Han majority Chinese. However Tibetans are not the only source of minority unrest in China. The Uighur population has been protesting for decades, and their struggle has recently been covered in the media due to their intense suppression by the government. But if we listen closely, we can hear what is being whispered in this message, even if we do not yet know its effects – the voices of all those suffering under oppression, seeking freedom from those enemies known as intolerance, fanaticism, hatred, and discrimination. As we listen to this particular act of witnessing by young Tibetans, we can rise to the challenge of making sense of an action that is, at its heart, anything but senseless. I recall the historic letter written by Thich Nhat Hanh to a member of another oppressed people, African-American activist Martin Luther King Jr. In it, he answers the question, “Why does he have to burn himself to death?” by refining our perception of the action from a position of seeing only a destructive end to one that turns its gaze back upon the movement itself. In so doing, we may arrive at a deeper understanding of what is being generated by these acts. The author is a PhD student in UC Berkeley’s Rhetoric department, where he is researching post-colonial Tibet and queer theory. “Fire Under the Snow” is also the title of an autobiography and documentary film about the experiences of Tibetan ex-prisoner and monk Palden Gyatso.